Hi guys, we are back! The most important topic for this update are the stretch goals. You must have been waiting for them, and we understand how important they are, especially in cases like ours, when the target has been reached but we still have a lot of time till the end of the campaign. The Lightpack team has spent quite some time brainstorming, and there was a lot of tough discussion within the team. Unfortunately, we are not able to add any hardware related stretch goals or let you update your pledges, while this would mean we will have to shift the delivery to a later date, and this is unacceptable for most of the backers. For example, we can’t add HDMI pass-through as a stretch goal as it would mean creating a completely different device. Bluetooth/Wi-Fi modification of Lightpack wouldn’t work as a stretch goal as well because the earliest possible release of this functionality is in November 2013. Most of these challenges are described in project FAQ. There was a lot of discussion about adding software improvements as stretch goals. We decided not to go for it because it would then assume that if we don't reach the stretch goal, we won’t bring the new software features into life, and this is not true — we would! Despite all peculiarities of the project, we managed to come up with several features which we would like to announce as stretch goals. If you have any other ideas (what could work as a stretch goal), please share your comments with us, we will for sure go through all of them. If your idea ends up in the stretch goal list, one Lightpack is yours for free (incl shipping)! We thought it would make sense to refine the sockets by adding caps to protect the cables from jams, which would make it easier to assemble and disassemble the LED modules. The render below gives you an idea on how it’s going to look like. In fact, caps will be tightly soldered into socket and we will need additional tooling to produce them (to get to know about tooling please read the "what do we need money for?" section). This is the reason why adding caps for LED modules is a stretch goal. In case of reaching the stretch goal all the Lightpack LED modules will be equipped with caps. Right now we are in touch with a team of the great service IFTTT.com to allow you using lots of different notifications. If you have any interesting idea please share it with us in the comments! In case of reaching this goal, the plug-in will be released in October 2013. We are willing to make iOS and Android apps able to control your Lightpack. Functionality includes turning lighting on and off, changing profiles, switching modes and choosing the backlit color. Device with app installed has to be in the same network as the machine with Lightpack and Prismatik software installed. Please note that remote control is the remote control only and it will not work for screen capture or other direct interaction with Lightpack. 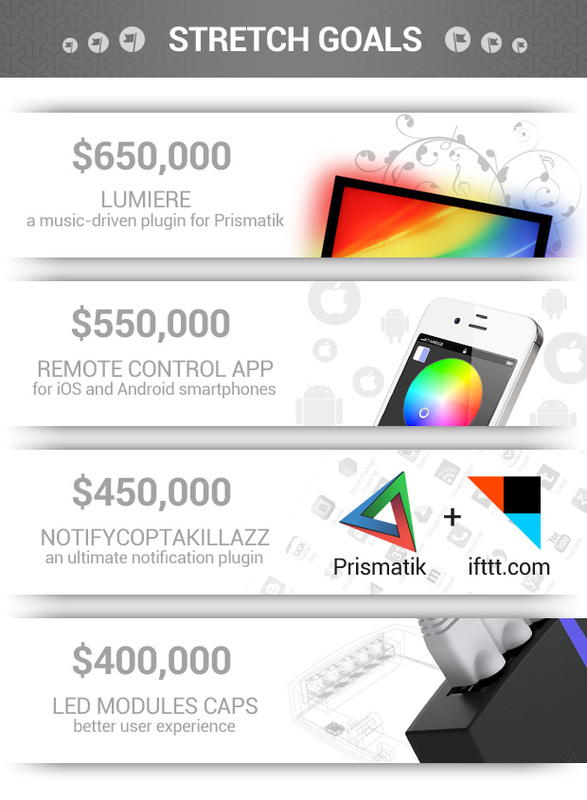 In case of reaching stretch goal we will release the apps in the end of October 2013. Flashing with music beat seems to be one of the most obvious Lightpack features. However, our experience proved this feature to be a challenge to work out-of-box. In fact, we have already tried to make the Winamp plug-in, but were not satisfied. Because of reasons stated above this is the later of our stretch goals. In case of reaching stretch goal we will provide this function by the end of November 2013. We believe this sounds yummy. Please help Lightpack to reach new peaks: share and like this update, follow Lightpack on Facebook and Twitter, e-mail your friends and call your grandma. This is our only chance! If i plugged it into a wireless adapter could I connect it to my tv this way? Stretch Goal Idea: I have not played with the software or read all of the comments so, excuse me if this is a repeat. A lot of TV's or monitors sit on stands. The light coming from the bottom wouldn't be as critical. Having the option in the software to position where the led modules are placed behind the monitor or TV. Giving you the ability to cast light from one, two or three sides of the screen only. This would allow a larger screen with a single Lightpack or eliminate reflection from a monitor sitting on a glass table. I have this all worked out in my head, but trying to condense for this comment. This might be a dumb idea but... What about making a simon says-like game? Using the colors on the back to do red/green/yellow/blue in patterns, and having to copy the patterns with the mouse on screen? I know it might not be all that great, but it could be fun. This is a fantastic idea...looking forward to seeing it progress! maybe a frame for better LED placement behind the TV would be nice :). And also a way to make the LED works with regular TV show .. 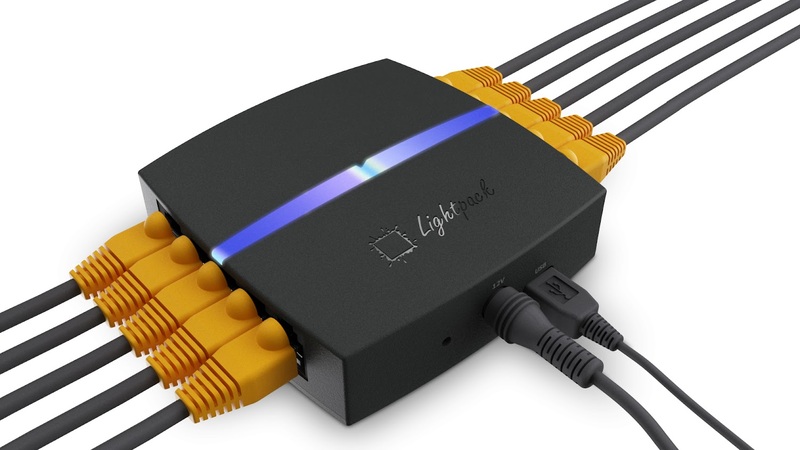 I think I may have figured it out already but would recommend you try to make it so that the Lightpack can be hooked up to a Wireless Range Extender and though that, one can have the video running on their laptop while having the TV in another room streaming the video while using the Lightpack. $400,000 stretch goal seems plausible to be reached, but as for the other, i dunno. There's not much of an incentive for the current backer to update their pledges anymore. I know HDMI/etc pass-through has been widely requested and you've mentioned it is not possible without a hardware redesign, so I'd like to suggest a solution: By making, at a later time, an "expansion" hardware that has these video pass-through ports and connects to the Lightpack by USB. Although I know it can be done DIY, I'm sure many other people would appreciate having a ready-built solution. This probably isn't so much a stretch goal suggestion but more of a general suggestion in respect to the whole project. How about a VESA mounted plate for attaching the Lightpack to in cases when the screen isn't wall mounted? It could also provide cable-tie points around the periphery of the plate to hold all the cables securely, lessening the strain on the strips/power/USB without requiring excessive amounts of sticky pads on the back of the screen. I know for example that my plasma gets pretty hot round the back-centre, so I'm slightly concerned about the longevity of any adhesive patch staying stuck. Best of luck with the project, can't wait to receive my units! Idea: What about the POSIBILITY to extend the lightpack with a usb/bluetooth dongle, so that the lightpack can get the informations wirelessly. Or is it now actually possible? A great thing would be to put more leds per strip. For example 6 instead of 3 rgb LED's per strip. In case of a small tv , someone could use only half strips and keep the others for later use (in case of some led gets burned).guys with larger TV sets would benefit from the extra light that would come from the extra led's. I would really like Infrared control support, so I can program my Pronto to include colors per source (green for Xbox and blue for TV for example). Nothing to fancy just set colors and modes and turn de device on or off. I also like the analogue input idea, just for analysis, so using a tuner that also has analogue output for older tvs and stick in it the lightpack and turn the device in signal detection mode. A way to turn the device on and off from the software would be required actually, I always have my media PC on, so when the tv goes off the pc is still on, would like to be able to turn the lightpack off. Windows phone support is high on my list, should be there with the other remote control apps. It would be cool if it would be able to sense if the computer is idle to slowly dim out until it even turns off the leds, then when the computer is active again to fade back in. What ab out the Windows 8 APP I suggested? What about an additional plug-in device for YPbPr or YUV support? Everyone would love you for that and you can charge extra. But most TVs would be supported. @Richard @Tom All of what we showed in our videos and project decription already exist. The point is if it is ready to work out-of-the-box, and what we have set as stretch goals is completeness and timing. For example, plug-ins for Gmail and Skype do exist (you can find it here: https://github.com/Atarity/Prismatik-plugins ). We want to build (and are successfully negotiating with IFTTT about) one out-of-box plug-in for every popular social service. Same with remote control apps. Plug-in of iOS remote control uses third-party commercial touchOSC app and in actual fact appears to be simplest 3 RGB-channels designer. We, in turn, want to release convenient and fully functional remote control apps designed purposely for Lightpack in such a close November. I thought that a remote control app was already going to be included with the product? That was the whole reason I am backing this project. Fair warning, if the goal for the remote control app is not met, I will be removing my pledge. Simple as that." Same here, I though that was an initial feature, may be I missed something? Program detection - would be a nice feature if the software detected which program is the one currently being used. So, for example, if you open open up microsoft word and google chrome, switching between the two programs would switch the colors of the lightpack to a preset customizable by the user. Also, to have the ability to set certain programs to take precedence with the color themes. So if I chose to be watching a movie on my primary screen, and chose to browse the web on my secondary screen the ambient lighting would go with the movie and not change because I have chrome open. I thought that a remote control app was already going to be included with the product? That was the whole reason I am backing this project. Fair warning, if the goal for the remote control app is not met, I will be removing my pledge. Simple as that. 3. Functionality to turn off (or, ideally, fade out) the lights when the display is turned off (i.e. - turn off the TV, the lightpack colors fade to black over 5 seconds). Remote control app for Win Phone or native HTML5 app: Everything is possible. For real. There's quite a possibility we will do this to provide more versatility and portability but it's still up in the air. Most of user-suggested plugins: It's simple. Perhaps our community will overrun us and create them before we do. It's actually easy to do for anyone even a little bit experienced in Python. The only obstacle is lack of API-documentaion in English. But it certainly will be there by the release time. Personally I'd rather have the best possible product even if that means several months of delay, This is exactly what the guys over at Securifi did with their Almond+ router, upgraded to USB3 increased memory, better CPU backer were more than happy to weight the extra time because every one here wants the best possible product. Hell people were even regretting not backing multiple units and trying to buy pledges off other backers. Come on, pull your fingers out guys, give us something we want! Prismatik and games: We are well aware of the DirectX and OpenGL support need. But it’s not a stretch-goals, because we have already prioritized a maximum amount of games support. Prioritized to the extent of seriously considering licensing the technology by the guys who are best in it. For example, Fraps or XSplit teams. Extra covers for light diffusion: We’ve actually performed several tests considering this but came to the conclusion that even though there is a slight effect enhancement it is still not adequate to the costs and setup complication for the end-user after all. Perhaps we could bring in diffusers some time in the future when such diffusers would be easier to handle and less expensive to create. Length of LED modules cables / number of LEDs, etc: This is all about the "fragmentation issue". You can read all the info on this matter in the project FAQ. USB Y-shaped cable: I’m sorry to say it can only be realized using USB hub. Both Lightpacks (or more) should be identified by OS and be powered from USB-host to make MCU starting and firmware booting possible. Several Lightpacks "chaining": It’s a rational idea but it requires a redesign of the electrical scheme and PCB layout. And as it was mentioned in our update release we’ve settled hardware revision in order to keep the production dates set. @Nathan Butler: The most common USB standard at the moment is 2.0. It’s not specified to power up as energy resourceful devices as Lightpack is. With USB 3.0 it gets more real, but this standard is not just yet common. Video pass-through of any kind would require more chips on the PCB to handle the video, be HDCP certified and there's the minor fact that HDMI is not free. You have to pay the HDMI forum for every single HDMI port that you want to use. You might as well be asking for HDBaseT pass-through, it has just about as much of a chance of getting made as these pie in the sky HDMI pass-through requests. It would be great that if you could use the USB port as a port for other types of hardware, such as a coax, hdmi, microphone, etc. module in the future... that way, you could add additional hardware support with firmware and driver updates without modifying the original hardware, and stay on your schedule. Another software idea would be something like programming events.. Set them to time, like flash for 20 minutes, then go rainbow for an hour, then repeat etc. but not have to keep a computer on.. basically load a set into the machine, and then let it run..
All in all, I am super excited about this device, and I am glad I got in on the double order when I did! Maybe others have said this but it would be nice to perhaps use only one power cable instead of two for those of us who backed for two or more. That and get directx fully working considering pretty much every game out there uses it. As for actual ideas for stretch goals I personally would like to see some form of on/off, preferably I would like to see the box turn off when the computer does or goes into sleep mode. Maybe some form of game integration (e.g. health bars down the side of screen) but that's more for modders as every game is different. Loving the product though guys and cannot wait for mine in August. I put in a vote for a Windows Phone 8 app for remote control. I understand why the stretch goals can't include hardware changes - and I am pleased. It is a sign that the product as it stands is production ready, and that we will be able to receive the Lightpacks when stated. It makes me more confident in the project than if you had said you could incorporate all sorts of changes. 1. Use self-adhesive tapes (like tapes for internal connections in laptops, phones etc.) connecting instead of CAT cables; you can get more durable versions of tapes, with/without self-adhesive side. 2. Switch from parallel cabling to serial - so we will have a box and one cable running around the TV. @Scott Helme - they requested backers input. Part of the request requires both positive and negative feedback. That is how a product is developed and becomes successful. Keep up the good work guys, great idea and product. Ignore all the negative remarks regarding stretch goals. If people are that bothered, they shouldn't back the project. All i could see in this stretch goal is nothing but are achievable by the community alone. Am i disappointed with the list of the stretch goal? Yes. I would rather replace my multipack pledges for one single lightpack with an HDMI pass-through addon, even though the ETA for it would be much later than originally stated. How about this stretch goal then, free lightpack shirt for all backers? I mentioned it in a previous update, but I would like to see color capture via an external camera. You could even make it part of your remote control app, simply put your phone in a stand, point it towards the TV, edge detection should be able to pick out the screen, and the colors are relayed over wifi to the controlling PC. If latency is too bad, then add PS3 Eye Toy support instead for use on a netbook or something. I am more than let down by these extended goals. Chances are the community will develop and support open source applications better than your organization. I think you and the team should head back to the drawing board and try again for the next update. At the very least re-work the base line to allow the strips to cover 60" displays. From following the comments that seems to be one of the most requested features. Thank you. -Add as an extra (attachable so it doesnt affect fabrication maybe?) a cover on the led to help light diffusing. Please no alternative attachment methods, if I really wanted to use velcro i'd just go buy it myself. Extension cables are pointless because these are RJ45 cables, if you want a longer cable, terminate it yourself. About my previous comment, wanted to suggest if it's possible to implement a kind of usb host on micro usb port so, through an usb Y cable or usb hub it'd be easy to connect both computer and usb dongle without adding another hardware port on lightpack. btw even if you told that can't develop any hardware modification, i still ask for an usb port implementation to improve features plugging bluetooth or wifi dongle or any other thing to expand the power of lightpack. 1. Cover on the led to help light diffusing. 2. New way of attaching the LEDs like Velcro . 1. A plug-in to put the LEDs in "line" to use them as an ambient light , for example behind the desk. Perhaps a good stretch goal would be to have some LED extension cable kit. Allowing the device to be used on Displays larger than 50". I realize it would be best to have more/longer LED strips, but extension cables will allow the strips to reach the outer edges of the larger displays, while keeping those with smaller displays from having a mess of cabling. Could also add a couple more ports for LED strips, and then offer a "large display kit" containing extension cables and a couple more LED strips. For a small goal, why not increase the number of LED's in the strip (not a HW change that should affect much, that I know of)? This way multiple unit's would not be needed for larger TV's I.E. 60" plus diagonals. 1. Write a Windows 8 APP. Why? Because of XBOX 720 support which will feature hdmi passthrough.